Hua Hin is a city in Thailand and has developed from a small fishing village into a popular seaside resort. The city is in the Prachuap Khiri Khan Province and despite having some development to keep up with modern times, has tried to remain as traditional as possible. 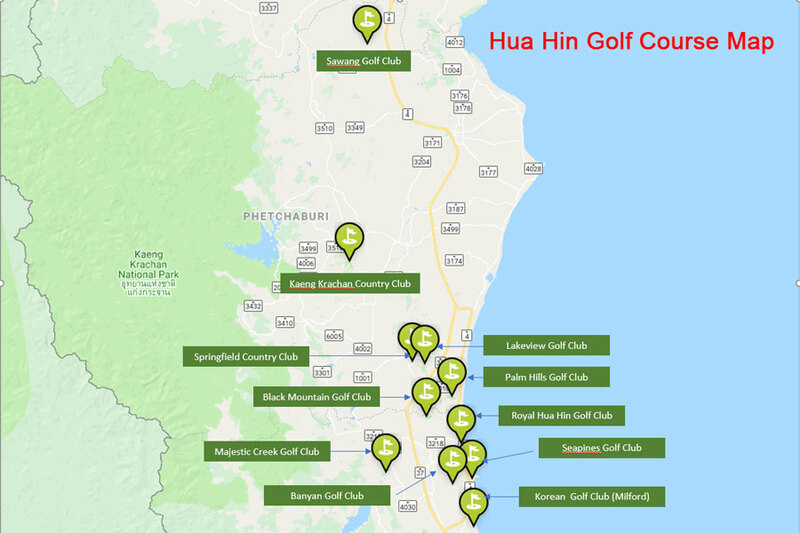 Many golfers are attracted to Hua Hin to play golf due to the variety and quality of the golf courses plus the climate. The tropical climate makes Hua Hin a pleasant place to play golf for much of the year but the best time to visit for a golf holiday is between November and February, when the weather is cool and dry. However, even during the wettest period of the year, which is September, the rain falls in short bursts and there is rarely a prolonged period of drizzle. When planning a Hua Hin golf holiday, you must consider how you are going to arrive and despite having an international airport, this is not the most convenient way to travel to the region. The best travel option to fly to Bangkok, which has many direct connections around the world and taking the train to Hua Hin. The journey takes around 2.5 hours and you could hire a vehicle if you prefer but you would be missing out on the arrival at Hua Hin Station, which is worth a visit in its own right. The station has a very traditional Thailand design and is a good place to start a Hua Hin golf map as right next to it you will find Royal Hua Hin Golf Course. So, immediately upon arrival you can head straight to the golf course and begin your first round of golf in Hua Hin. Moving slightly closer to Hua Hin city and just 30 minutes away by car you will find . If you were to play just one golf course in Hua Hin, you would have to make it Black Mountain. This is regarded as one of the best golf courses in the world and should not be missed from a Hua Hin golf map. Black Mountain was designed by Phil Ryan and opened for play in 2007. It quickly established itself as one of the top golf courses in Thailand before winning worldwide acclaim. What was once pineapple plantations and dense jungle has been transformed into a world class golf course which played host to the Asian PGA Tour and the Thailand Classic before becoming a regular feature on the European Tour. The natural creeks and rocks have been kept in place at Black Mountain and feature regularly throughout the 27 holes which have been divided into the East, North and West courses. The East Course is the original first nine holes and water comes into play regularly. The North Course is the original back nine holes which is rockier than the East Course while the West Course is a new addition, having opened in 2016 on which you will find tricky, strategically placed bunkering throughout. The fairways are wide enough for short hitters and beginner golfers but become narrower for those who hit the ball longer. There are many risk/reward holes and you face many strategic decisions in terms of the best path to the green. The quality of Black Mountain Golf Club is superb and you will struggle to find a better conditioned course anywhere in Thailand. With a clubhouse boasting a 360 degree view of the golf course plus fine dining and a spa, you are guaranteed a great day of golf at Black Mountain Golf Club. Moving back towards the ocean and further south of the city you will find Banyan Golf Club. Having opened for play in 2008, this golf courses quickly became a firm favourite of those playing golf in Hua Hin and it won the award of Best New Course in Asia-Pacific by the readers of Asian Golf Monthly the following year. Thailand’s leading golf course architect Pirapon Namatra was the person at the centre of the design and he has produced a fantastic 18 hole golf course at Banyan Golf Club. You can enjoy excellent views of the ocean and mountains from many of the holes and there are four tee boxes on each hole, making Banyan Golf Club suitable for everyone. It is tough to pick out an individual hole as being the standout as they are all excellent but the signature hole is the par-3, 15th. This is where you will find the most spectacular views of the mountains and ocean from the elevated tee boxes. The hole is not very long, playing to just 147 yards from the back tees but the wind makes it very tricky in terms of keeping the ball on target to the green.In addition to the golf course you will find a practice range and two practice greens complete with bunkers. Banyan Golf Club is rated very highly in Thailand and you must include the course on your Hua Hin golf map. Royal Hua Hin Golf Course Map is the oldest golf course in the whole of Thailand and is a very special place to play golf. Established in 1924 for the British railway workers and Thai aristocracy, the course is a par-72, 18 hole challenge playing to 6,678 yards. If this is the first golf course you play in Hua Hin, you will be treated to some lovely views of the city centre and Gulf of Thailand which will peak your curiosity for what is to come later in your Hua Hin golf holiday. Royal Hua Hin Golf Course is a parkland style layout with natural jungle surrounding many of the greens and fairways. Look out for the monkey’s who are often seen enjoying themselves in the vegetation along the 13th hole and have been known to take a liking to the occasional golf ball. The actual playing conditions at Royal Hua Hin can vary throughout the year but with the history and location, it makes the ideal start to a Hua Hin golf map. Moving north and slightly inland from the coast you will find Palm Hills Golf Club. This Hua Hin golf course opened in 1996 and boasts an 18-hole championship course which is just 30 minutes from the centre of the city. The setting of Palm Hills Golf Club is special, with lakes, rolling green hills and sweeping fairways waiting to welcome players. The fairways are wide and both locals and visitors alike enjoy playing golf at Palm Hills as it is suitable for players of all abilities. The water hazards and bunkers mean you cannot switch off during a round but thanks to the great conditioning and surrounding nature, everyone will enjoy a round of golf at Palm Hills Golf Club. Just an additional 10 to 20 minute drive further north from the city of Hua Hin, you will find two more golf courses to enjoy. The first you will come to is called Lake View Golf Club and this was designed by Roger Packard and offers 36 holes of great golf. Opened for play in 1993, Lake View was originally an 18 hole golf course but an additional 18 holes were added in 2006. The original 18 holes will test even the best golfer and features a large lake, streams, undulating fairways, hidden greens and doglegs. The 14th hole, which is a par-3 features a tee box and green surrounded completely by water. The new set of 18 holes, split into two sets of 9 holes have been named the Desert Course and Links Course and live up to the name, with very few trees and wide, open spaces. The onsite resort with swimming pool, restaurant and tennis courts mean you could stay at Lake View Golf Club but if you have accommodation in the city, you are close enough to complete the trip comfortably within a day. To the north east of Lake View Golf Club you will find Springfield Country Club and this is perhaps the furthest you will travel away from Hua Hin city yet it takes just 45 minutes to make the journey. That’s one of the great things about playing golf in Hua Hin, everything is close by and you will not need to make long trips each day to the golf course. Springfield Country Club offers 27 holes of golf which were designed by Jack Nicklaus. Surrounded by nature, including tree-clad hills, this golf course regularly features at the top of the list when discussing the best in the area. Each hole on the course has five tees, making it suitable for advanced and beginner golfers and you will find steams, lakes and the signature Nicklaus waste bunkering all comes into play during a round. Springfield Country Club has been split into three sets of nine holes entitled the Mountain Course, Lakes Course and the Valley Course. Each of these live up to their name and you will find an exciting and varied challenge whichever combination of the two you decide to play. Being so close to Hua Hin city, you could even return for as second day and enjoy playing a different combination of courses. The most inland of the top golf courses in Hua Hin is Majestic Creek Country Club. It will take you just over 30 minutes to reach this golf club from Hua Hin and again this highlights just how close all the best golf courses are to the city in this region of Thailand. Situated in the hills to the west of Hua Hin, Majestic Creek Country Club features an 27-hole, par 72 golf course. It joins many of the other courses in the Hua Hin area by having three sets of nine holes to enjoy. Designed by Dr. Sukitti Klangvisai and opened for play in 1993, Majestic Creek is split into the Creek Course, Lake Course and Waterfall Course, each with characteristics that live up to the name. Two holes on the Creek Course require shots over a creek while those who enjoy playing over water will love the Lake Course, especially the 8th and 9th holes. The Waterfall Course does indeed have a waterfall on the 5th hole but as you would expect, it does not come into play at all during a round of golf but makes for a great showpiece as part of the surroundings. The clubhouse has been renovated to keep up with modern standards and Majestic Creek Country Club is regarded by many as being the best layout in Hua Hin, so you must try it to see for yourself. If you are willing to travel further afield you can add three more golf courses to you Hua Hin itinerary. The furthest of these is Sawang Resort and Golf Course which is just over an hour north from the city of Hua Hin. This golf course is located in a rural area, surrounded by rice fields and fruit trees. It is enjoyed mainly by local players and but is a good place to enjoy a round and a perhaps chat to local golfers. Also north from Hua Hin you will find Kaeng Krachan Country Club and it takes roughly the same time to reach this course as Sawang Resort and Golf Course. Situated in a remote location compared to many of Hua Hin’s golf courses, Kaeng Krachan Country Club is close to the national park of the same name and boasts an additional nine holes designed by Jack Nicklaus to the original 18. Finally, travelling just 20 minutes south from Hua Hin city you will find Korean Golf Club. This course was designed by Robert McFarland and is known for being one of the toughest in Hua Hin. Korean Golf Club has a links style feel to it, with accurate tee shots required to set up good approaches to fast greens. If you are left on the wrong side of the hole, you will struggle to get down in two so pay attention to pin position. Playing golf in Hua Hin is a tremendous experience. Not only do you have a good choice of fantastic golf courses but many of them are within 30 minutes of the city. You can base yourself in Hua Hin and have little trouble playing all the top golf courses in this region of Thailand.